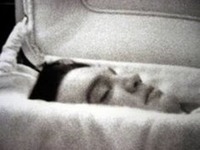 I have never seen that casket picture, but that's definitely something unusual, if he was somehow made to look thin. I have never heard of an obese person in a casket suddenly looking slim and trim no matter what they are able to do with makeup or slimming attire. Very odd. Thanks for posting the photo, Joanna. He doesn't look anything like he did just before he died and what did they do with his huge stomach? People are saying that they think it is a wax figure in that casket. Here's a YouTube video showing the nose profiles side by side: www.youtube.com/watch?v=5bWi7tDNF_s and I agree that his nose does look different. This is a photo of Elvis taken seven weeks before his death at his last concert, which was held in Indianapolis, June 26, 1977. He was 6' and it's obvious he weighs a lot more than he did in his prime, but he isn't a bloated, overweight slob. It is said that he gained a lot of weight in his final weeks at which time he allegedly weighed around 260 pounds. There are claims, however, that he weighed more than 300 pounds at death. To me, the pictures just make things more confusing. 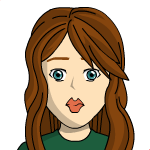 The one that Natalie posted shows that his face is bloated, but that could be from both weight and from retaining water. The one Lee posted shows that just 2 months before he died that he wasn't what you would call obese. I've seen him in pictures where he was what I would call obese, and I think that you have to weigh at least 100 pounds more than your normal weight to be morbidly obese, which means that even if he weighed 250 or 260 pounds when he died, he still wouldn't be a hundred pounds over his normal weight. So what happened between June 26th and August 16th? I know something about gaining and losing weight and I think that he was a binge eater and binge eaters can gain 20 pounds in a month, maybe more. Then he would take amphetamines to lose the weight before a concert. The constant gaining and losing stresses a person's body and it may not have been what caused his heart attack, but it didn't help any. But something else that I find strange is that he had a concert coming up in Maine, yet he wasn't dieting because on the 16th, he was eating ice cream and chocolate chip cookies. A lot of things about his death are confusing. It's easy to understand why a lot of people think that he faked his death. I agree, Kitty, it does seem that more information just makes things more of a mystery. 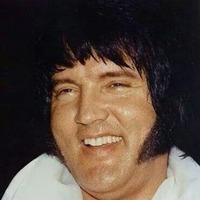 I've seen Elvis in photos where he was definitely a fat slob, but he looks fine in the photo from his last concert. I also think that it's very strange that someone taking amphetamines to lose weight for an appearance would be eating ice cream and cookies. My understanding of amphetamines is that they completely kill the appetite and make you hyper, which is the reason that they're called "speed." Sometimes I think that he faked his death, but if he did, a lot of people were in on it and it's impossible for that many people to keep a secret for the rest of their life. It's possible that there weren't all that many people in on it. If he was planning his own death, maybe he hired an Elvis impersonator who was terminally ill that was his same height and was overweight. When people are dead, they don't look exactly the same as they did when they were alive. I know people are going to think that I'm crazy, but I didn't start thinking this until that photo of him at his last concert was posted and he isn't grossly overweight, but people who saw him dead said that they saw rolls of fat and said that he was obese. Substituting an overweight, terminally ill Elvis impersonator is really "out there," Kitty. Tomorrow, it will be 39 years since Elvis died; if he died. On Aug. 16, 2017, we will celebrate 40 years since Elvis Presley died. In 2016, however, we celebrate 40 years since the last time The King of Rock ‘n’ Roll visited Syracuse. 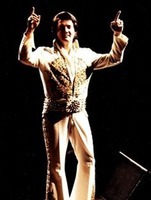 Elvis, then 41, performed two sold-out concerts at the War Memorial in July 1976, giving 16,000 fans their final chances to see the legendary rocker in Syracuse. He sang many of his classics, including “Hound Dog,” “All Shook Up,” “I Got a Woman,” “Can’t Help Falling in Love” and “Don’t Be Cruel.” The July 25 show went down in Syracuse history, thanks to a scathing review by Dale Rice, a 25-year-old education reporter for The Post-Standard. Rice was not a music critic. At the time, the newspaper didn’t employ a full-time music journalist, so various reporters from the public affairs department would be sent to cover major acts in Syracuse. Rice later said no education or city hall story ever brought him as much attention as his Elvis critique. Fans of The King responded with outrage. Hundreds of furious letters and phone calls flooded The Post-Standard newsroom, calling Rice’s review “totally unfair,” “uncalled for” and “completely wrong.” The morning the review was published, angry fans managed to track down Rice’s home phone number. Rice woke up to several phone calls with “strings of expletives.” He eventually unplugged his phone and went back to sleep. The letters kept coming, and The Post-Standard even had to run an editorial on July 30 asking readers to “let the controversy die.” The editorial promised readers all their angry letters would be saved for Rice to read when he returned from his Wyoming trip. 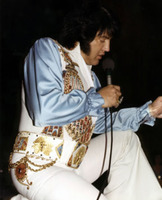 Elvis planned to make a return appearance at the War Memorial, Aug. 20, 1977, but never did. He died of a heart attack in Memphis on Aug. 16. Source: Katrina Tulloch and Johnathan Croyle, Syracuse.com, August 12, 2016. As a teenager growing up in the 1950s, Steve North would look for the pink Cadillac outside the stone house at 1215 Gallatin Road, South, in Madison, Tennessee, the outskirts of Nashville. Decades later, he bought the property and practiced law at the unassuming former home of Col. Tom Parker, the rough-around-the-edges manager who helped steer Elvis Presley to stardom. Elvis’ old home-away-from-home is now on the brink of being torn down and replaced by a car wash. North has spent four years seeking a buyer who would preserve the building. In a city where real estate prices are booming, he found none willing to pay the $625,000 market price while promising to keep the house intact. In 2014, RCA Studio A was slated for demolition on Music Row, near downtown Nashville, to make way for luxury condos. Musician Ben Folds, who rented the space for 12 years, led the charge to preserve it and a philanthropist ultimately bought the studio where Elvis, Willie Nelson, Waylon Jennings and others recorded. Music Row has seen several music industry properties knocked down, and the district is perpetually on Historic Nashville’s list of properties most in danger of demolition. While growing up in his Madison neighborhood, North took for granted seeing music legends such as Elvis, Eddie Arnold, Ferlin Husky and more at the grocery store and elsewhere. He’d wave at Elvis in the yard. The king of rock ‘n’ roll would wave back. Parker owned the home from 1953 to 1992, and whenever Elvis came to town to record music at Studio B on Music Row, he’d stay with the Colonel, according to Jones. Elvis had his main home in Memphis, Graceland, which has long been a major tourist attraction. Parker is credited with landing Presley’s $35,000 recording contract with RCA Victor in the mid-1950s and lining up such early TV appearances as The Ed Sullivan Show. Parker died in 1997. The car wash developer awaits a scheduled zoning hearing and North said the project is likely to go forward regardless of whether it’s granted several variances. Nashville Metro Councilman Anthony Davis wants the meeting delayed and a public meeting scheduled so the developer can talk with the community. “If nothing else, deferring allows for the applicant to answer questions … and it allows a little more time, in case there is a buyer out there that could possibly satisfy the community desire to preserve this building,” Davis said. And though North has already signed the contract, preservationists still hold out hope. “Until the wrecking ball’s out there actually knocking it down, we’ll never give up,” Jones promised. Source: Associated Press, January 5, 2017. I hope that they save the Colonel's house. It's part of music history and could be turned into a tourist site.